At the apex of a mountain pass, high in the Strielwall Peaks, stands a ruined fortress. 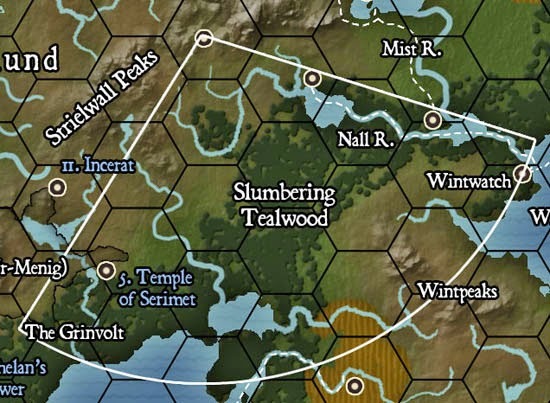 Once a Seree garrison, it is now occupied by a peaceful band of giants and the assortment of people devoted to them. Inside, the giants work to perfect a ritual of tea making, a task they see as essential to the well-being of the lowlanders. This release is somewhat autobiographical (at least metaphorically), which it seems can happen to me when I'm listening to powerful music while writing. My first clue was a weird tickle in the back of my throat; I figured if I could get through explaining it to my wife without cracking, it was my imagination and I was in the clear. Nope, she saw right through it instantly. Also, Splitpeak House is not a self-contained "adventure", for two reasons. First of all, it works best as a doorway to Tealwood which I plan to develop more, although you can of course replace Tealwood with anything you like. Secondly, there's no obvious threat to be overcome, unless you play the giants as villains (as would be the case if you reduce the threat implied by the Sidhe). There's a weird project afoot, and it looks bad, but in a sandbox campaign the giants could become extremely useful allies. 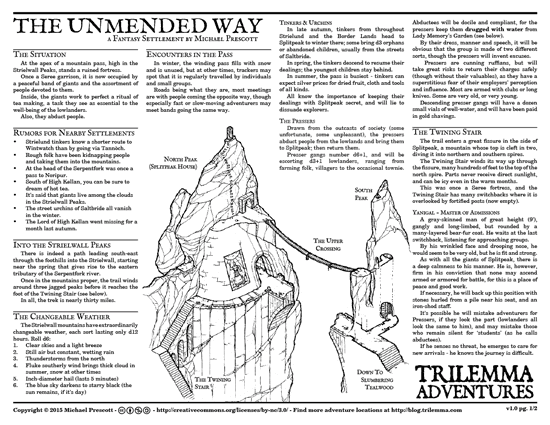 Not only is the skill they impart a vital survival skill in Tealwood, but (more mundanely) because of its location: the giants are guarding a mountain pass along a useful route, and have a reason to feed and shelter passers-through. EDIT: Here's the map art. As always, it's CC-BY-NC.